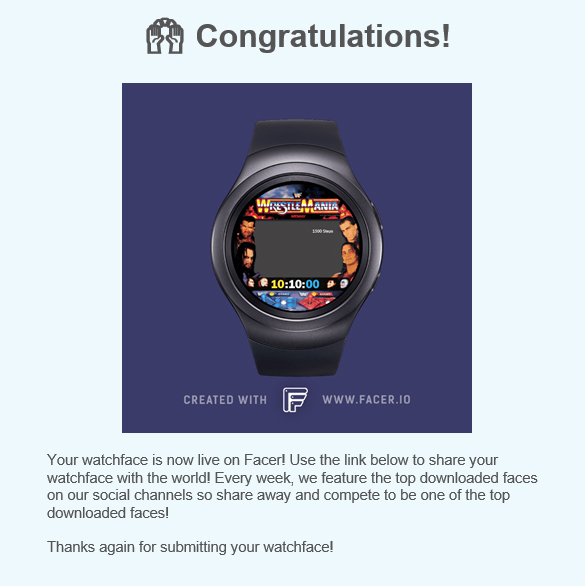 So I designed this watch face today, similar to a lot of other faces I have designed and it was automatically removed due to copyright for "CHOPARD". Now this sure doesnt look like a Chopard brand watch. Even the missing GIF file wasnt related. Has this happened to anyone else before? Any idea how I can speed up the Appeal Process? Did you use a somehow similar word in your description? I thought about that with my hashtags and Nope. Nothing even close. Unless you count the word Hart. Either way I just want in unblocked. Any idea how long it would be before I can access it again? Really dont feel like recreating it. Even though it's just a simple design. Hi @marco1976 - this is likely indeed a false-positive from our automated system. Make sure you appeal and somebody will review the issue and re-activate the face if it's confirmed. Cheers!